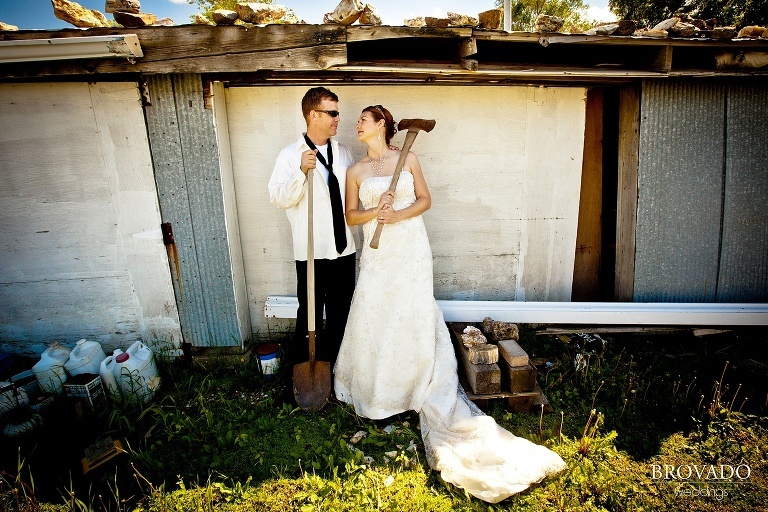 There’s a fun story behind this North Dakota “Trash the Dress” photo shoot. My photography crew and I were gearing up to photograph a beautiful mountain wedding in Fairfield, Idaho. We were taking my Centurion, a fast flying six-seater airplane that would get us there in a fraction of the time it would take to drive. I mapped out our route and when I was looking at flying through the Dakotas, I thought I’d give some of my past wedding clients, Valerie and Bill, a call since they lived in Bismark, ND. There’s somewhat of a back story here… A couple weeks earlier, Valerie had posted a photo on my facebook wall of the woods in North Dakota where we had shot the majority of her bride and groom photos on her wedding day. 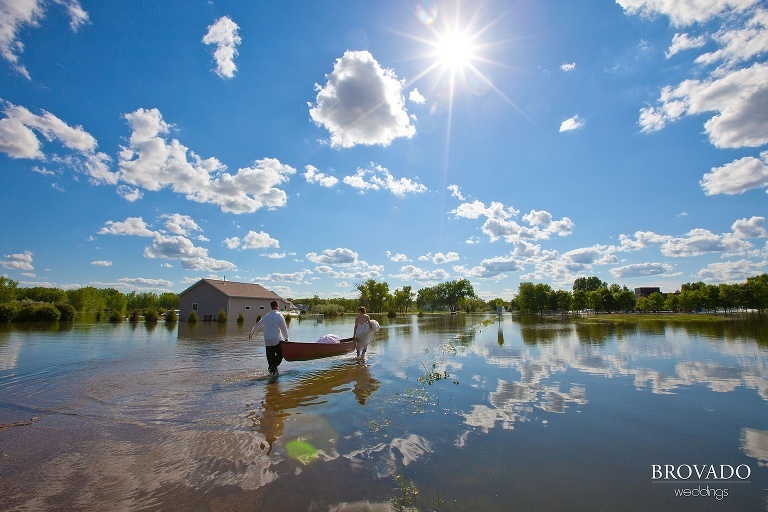 In the photo, those very same woods were now under 6 feet of water due to the recent flooding in Bismark! So I had an idea. 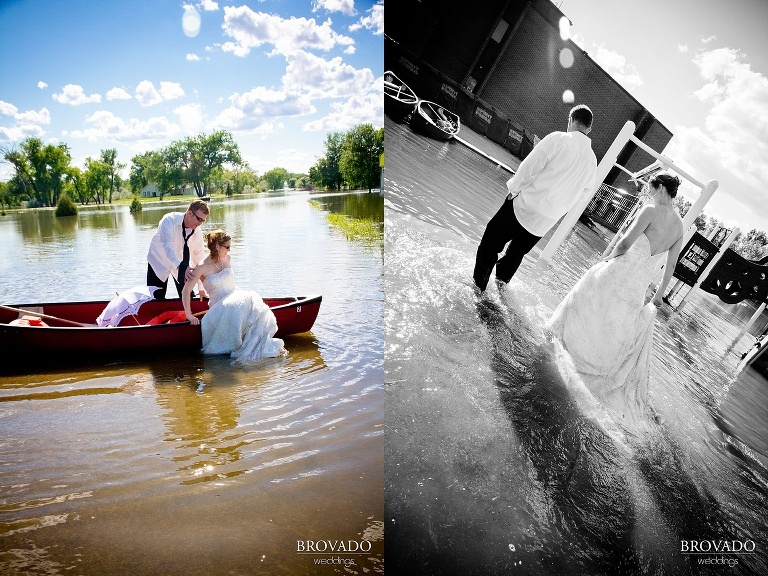 When Valerie answered my call, I asked her if she and Bill would be interested in doing a Trash the Dress photo shoot in the flooded woods. It was, after all, right around their one year anniversary mark. How perfect would it be to trash her wedding dress, on her anniversary, in the same woods in which we took her wedding photos? She talked it over with Bill and called me back. They thought it was a great idea! So I scheduled a stop in Bismark on our way out to Idaho. This Trash the Dress session was fun on so many levels. The weather was warm and perfect. Valerie and Bill had a blast. The local news station even came out to document what we were doing, and made a little inspirational piece to air on the Bismark evening news that talked about Val and Bill’s idea to make something good and beautiful come of the flood waters that had been so devastating to that part of town.